It sees a wide cross section of people and nationalities. Including many who probably don’t even know why they’re there!! Angkor, the “Capital City” or “Holy City”, existed for about 400 years. The end coming with the moving of the capital to Phnom Penh in the mid 1400’s. Yet, the Angkor region was never completely abandoned. In 1907 a restoration process started by France and was interrupted in the 1970s by the civilian war. In 1993 UNESCO, India, Germany, and Japan finally collaborated in a major restoration. Today, the archaeological park of Angkor extends for 400 square kilometres. It includes forested areas and local villages inhabited mainly by farmers. The nearest city is Siem Reap, which offers a vast choice of accommodation, restaurants and easy access to the site. To enter the park there is a $37 daily fee, and multi-day tickets are available: 3 days for $62 or 7 days for $72. Payment by cash or credit card. We chose the 3-day ticket which was perfect. You can use the three days within a 10-day period, which allows you to break up your temple-visiting marathon. Getting around is pretty easy, either by getting a tour (our option) renting a bicycle or motorcycle or hiring a tuk-tuk. The park is about 7 km from Siem Reap but some of the distant temples are about 50 kilometres away. We were there in December, the cooler season, and the temperature was perfect. Cool in the early morning, but pretty hot in the middle of the day so cycling the ruins could be a bit tough. We took 2 cheap tours and were glad we did. Coordinated by our likeable and competent guide T we (there were only 5 of us) had a good day. ​Our day started with a drive through town rounding up people from various locations. If you are first to be picked up this can take an hour. We then stopped at the ticket office to get our tickets. This is quite a slow process as each ticket includes a photograph. Payment can be by cash or credit card. Starting at Banteay Srei about 40k's from Siem Reap we made our way back to lunch and then visited a few more temples. The day was informative and well scheduled. It ended at about 4pm with us tired and “watted out”. The temple built with red sandstone in the 10th century is entirely covered ​with beautiful carvings. It is also known as the ladies’ temple because of the detailed small carving that could have been done by ladies’ hands, and because of the many dancing girls that are portrayed in them. Banteay Srei is about 30 kilometres from East Mebon. East Mebon is a mountain temple dedicated to Shiva built by King Rajendravarman II halfway the 10th century. Constructed on a man-made island in a huge water reservoir. Measuring 2 by 7 kilometres, it was only reachable by boat.The baray is now dry. The East Mebon was not Rajendravarman II’s state temple. That was Pre Rup, built 9 years later, close to the baray and directly south of the East Mebon. In the 1930’s two French conservators started restoring this temple. Its main attraction is its intricate lintels They are very well preserved and among the best in Angkor. Ta Som is a small temple at the Eastern edge of the Jayatataka baray. The Bayon style monument was built by King Jayavarman VII in the late 12th century. The King dedicated Ta Som to his ancestors. The Bayon style is evident in the East and West gopura (entrance) building of the outer enclosure, which is topped with large faces facing in all four directions. The temple orientation is towards the East. Three enclosures and a moat surrounds a single sanctuary tower in the centre of the temple. Dedicated to the Buddha, the lintels and pediments of the Ta Som also contain Hindu scuptures. This mountain temple was built around 961. It was originally dedicated to the Hindu god Shiva. Pre Rup was the state temple of King Rajendravarman II. In the early 20th century Pre Rup was completely overgrown and covered with soil. Excavated during the 1930’s by two French conservators. It is a popular location to admire the sunset, but if you want a good spot to enjoy the view, you need to be there early. The Neak Pean temple built in the 12th century on an artificial island is surrounded by four artificial ponds. This temple was probably used for medical purposes. The structure is similar to Anavatapta, the lake on the Himalayas whose water is said to cure illness. To get to this temple you cross the lake on a wooden bridge. The lake reflection is interesting with the white trees emerging from it creating a surreal feeling. King Jayavarman VII, a Buddhist king, in the 12th century built this temple on the site of his victory against the Cham invaders. The people who occupied the area that is today middle and south Vietnam. The complex is not completely restored and there are piles of fallen blocks behind the windows and down the passages. Small Tour Circuit $13 per person from 8:30am to 6:30 pm. This was a full bus of 28 people and apart from the pick up and drop off which obviously took some time it went well. Our guide again was T who has the unenviable task of coordinating the day. As this full day tour includes Ankor Wat and the sunset at Phnom Bakheng It is very popular. The visits to the various sites was well managed. The only downside is that only 300 people are allowed at the top of Phnom Bakheng at any one time. So after getting there early and racing up the hill to get our pass we sat on the floor in the sun for about 2 hours waiting for the sunset. It was disappointing, but that's just the luck of the draw. Our second day of exploring started with the customary drive around town rounding up people … quite a stressful time for the tour guide!! The first stop was Angkor Wat which is the largest religious monument in the world, and the symbol of Cambodia. Built at the beginning of the 12th century by King Suryavarman II, who followed the Hindu religion. Planned to be the king’s mausoleum the temple was then dedicated to the god Vishnu. This temple is atypical in that it is West facing. The walls around it are 3.6 km long and decorated with reliefs with episodes from Hindu mythology. Later kings changed the building and its decoration to reflect the Buddhist belief. Is the famous temple used in the sets for the movie ‘Tomb Raider’. Due to trees and vegetation growing on it, and its series of half-collapsed tunnels, this temple can be quite photogenic. It was another temple built by Jayavarman VII as part of his big public construction program. To protect the temple from growing roots damaging the structure and from the danger of falling trees destroying the monument, a number of trees were removed, scaffolding inserted and restoration work carried out. Inside Angkor Thom, there’s Baphuon: built before the 11th century. Initially following the Hindu religion, it was later adapted to reflect Buddhism. A few steps away from Baphuon is the Royal Palace. In front is the terrace of the elephants that was used for public ceremony and has been decorated with some well-preserved reliefs. The ‘temple with the mysterious stone face towers’. The faces are probably portraits of king Jayavarman VII, under whom the temple and the monumental city was built. It is a mountain temple built to represent Mount Meru, the centre of the universe in Hindu and Buddhist cosmology. The King had the temple constructed in the centre of Angkor Thom, the 9 square kilometre large capital city of the Khmer empire. Four roads from the four entrance gopuras of Angkor Thom lead directly to the centre of the temple. A brief stop at the south gate was enough time to take a few pictures and then move on. The Phnom Bakheng temple was built around the year 900 in Yasodharapura by King Yasovarman I, also known as the leper King, as he suffered from leprosy. Yasovarman I moved the capital of the Khmer empire to a location near the current day Siem Reap, where Angkor Wat was to be built more than 200 years later. After racing up Bakheng Hill to claim one of the 300 allowed spots and then sitting on the floor for over an hour and a half we watched a very disappointing sunset. It’s the luck of the draw the day you choose so don’t be disappointed if nature doesn’t serve up a magnificent show. Watching the sun rising from in front of the majestic building is “must do” on a trip to Siem Reap! Before sunrise there is an exodus of people out of the city – bicycles, buses and tuk tuks. So you’ll be there with a few thousand people who are going to line the front of the pond to have the best shot of the temple and its reflection on the water. Unless you are there early you will be in the third or fourth row back and your pictures may include the back of a lot of heads!! If you don’t care about taking pictures, get there later, find a comfortable spot and just enjoy the moment. Both the Grand and Small Circuit Tours are tiring but in 2 days you get to see the important temples and you get some insight into the history from a tour guide. 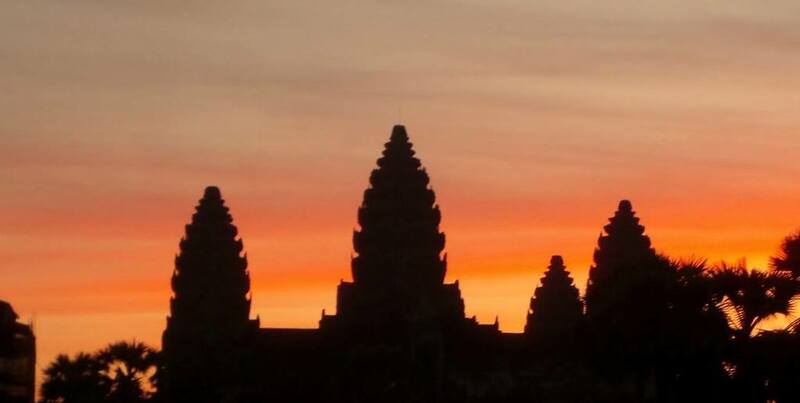 The sunrise at Angkor Wat is a memorable experience. Not only for the sunrise itself, but also for the whole experience of being there. Angkor for me was not as impressive or enjoyable as Bagan. It is different. Angor Wat itself is massive and its sheer size makes it imposing but it doesn’t have the refinement of many of the pagodas of Bagan.